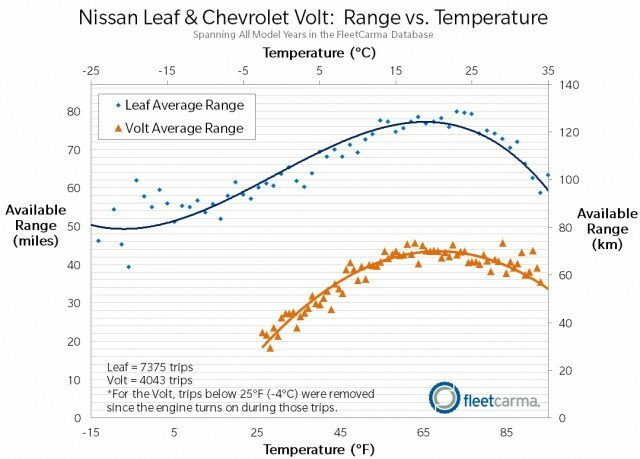 Just in time for the holiday-feast season, we now have published charts that detail the effect of cold weather on the battery range of Nissan Leaf and Chevy Volt electric cars. The data comes courtesy of FleetCarma, the Canadian company whose app MyCarma tracks vehicle operation for fleet managers and a small number of private owners as well. 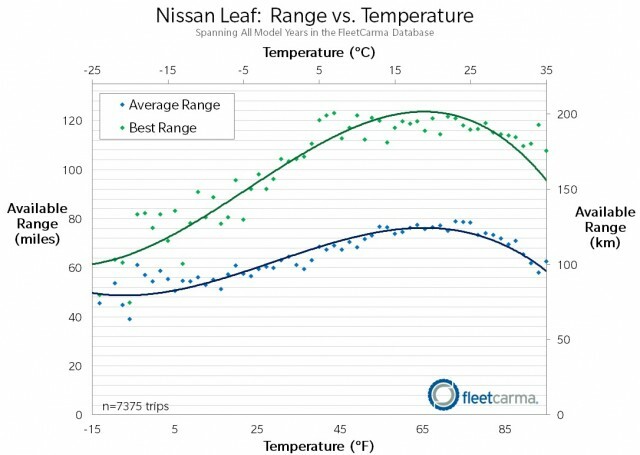 The firm compiled data from more than 7,000 Nissan Leaf trips to determine how temperature affected the cars' real-world range. And the data includes drivers using cabin heat in the winter, and air conditioning in the summer--as they tend to do in actual use. As FleetCarma notes, the "Goldilocks zone" (just right) for maximum range seems to be 60 to 75 degrees F (15 to 24 degrees C). Lithium-ion battery chemistries lose performance at the same temperature extremes where driver preferences to stay around 70 degrees come into play. Fast degradation of the air-cooled Nissan Leaf battery pack in a small number of extremely high-temperature locations, especially Phoenix, Arizona, is leading the world's highest-volume electric-car company toward deploying a more heat-tolerant battery chemistry as early as April 2014. 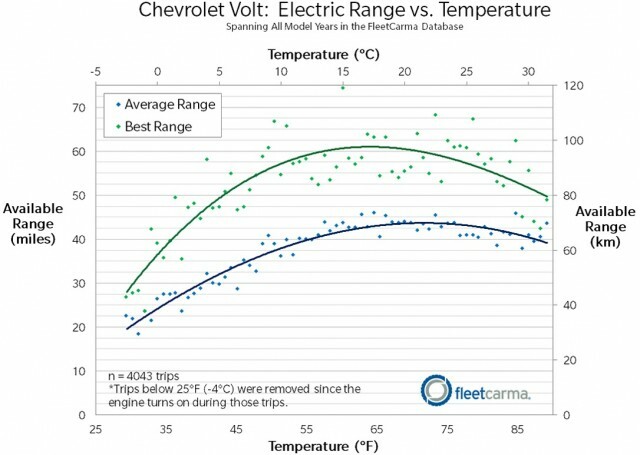 The data set for Chevy Volt range-extended electric cars used by FleetCarma was smaller, at about 4,000 data points, as the analysts excluded trips taken when the temperature fell below 25 degrees F (-4 degrees C). Below that temperature, the Volt periodically runs the combustion engine, which distorts results based on continuous battery range alone. FleetCarma charted the best range results alongside the averages, showing that some Volt hypermilers were able to increase electric range more than 30 percent over others--achieving about 60 miles vs. 45 miles (roughly 95 vs. 70 km). Shockingly, Leaf hypermilers sometimes beat the averages by 60 percent, garnering 120 miles of range against 75 miles (195 km vs 120 km) for the mere mortals among their peer group. One wonders whether a ski hill was involved. 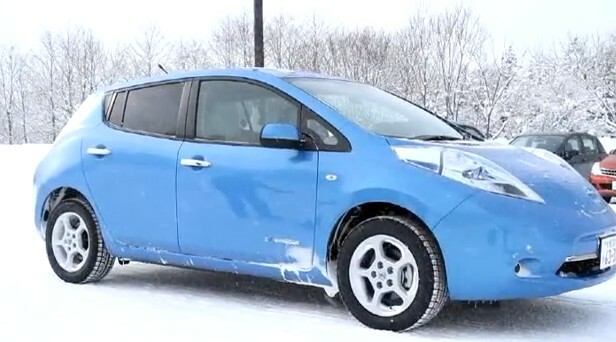 Development engineers at Nissan and Chevrolet closely studied their batteries' behavior in different temperature in the test lab--but they could only get limited data from their own extreme-weather testing as to how that would affect battery range across the very wide spectrum of driver behaviors. These kinds of data gathered by FleetCarma will help automakers fine-tune future development efforts, as there's simply no substitute for large sets of field data. No verification protocol–however rigorous–can provide the breadth and quality of feedback that comes from widespread deployment. Happily, FleetCarma's charts provide exactly that information. Hint of Big Data to come? Ford is known to have embraced Big Data early, and its competitors are surely following suit. But while each carmaker would probably love to track all of their customers' driving habits, the post-Snowden era could produce a backlash over the privacy implications. This may open a niche for arm's-length, third-party vehicle monitoring services like FleetCarma, Automatic, Zubie, and others, which serve an opt-in clientele that wants to monitor their own driving habits. So whether you celebrate Christmas, Hanukkah, Kwanzaa, Festivus, or nothing at all this holiday season, if you're driving on plug power, be aware of the temperature--and plan accordingly.